Torture: Which Side Are You On? President Trump says he'll torture. Will your senators and representative stop him? As a constituent, I am concerned. President Donald Trump proposes to torture. Senator John McCain says he'll stop it. Torture has been a felony under the anti-torture statute and the war crimes statute in the U.S. Code since the Bill Clinton presidency. Presidential memos or "executive orders" purporting to ban and un-ban torture cannot alter that. As a member of the Convention Against Torture since the Ronald Reagan presidency, the United States is actually required to prosecute all complicity in torture. 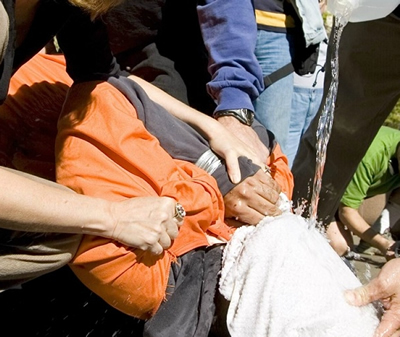 U.S. laws banning torture didn't begin in 2015. They include the Eighth Amendment to the Constitution, the Universal Declaration of Human Rights, the International Covenant on Civil and Political Rights, and the Geneva Conventions. If the U.S. does not enforce the law against U.S. torturers, other courts around the world can do so through universal jurisdiction. President Trump says torture works. The Senate Torture Report's censored summary (and the full report according to Senator Dianne Feinstein who ought to put it into the Congressional Record to end the debate) -- as well as all other available evidence -- says torture does not work. That debate aside, torture degrades us. It proliferates to cases not even pretending to morally justify it. It tears down the rule of law. It's imitated by others. It generates false propaganda for war. And it generates anti-U.S. violence. Will you put an end to torture now? What is your position? Please tell me. Email* or from Brave New Films. You can unsubscribe at any time.